The mountains of France are accessible to everyone! Ski 2 Freedom ranks France exceptionally high when it comes to providing expert assistance for anyone with a physical, neurological, sensory or other medical / health condition. 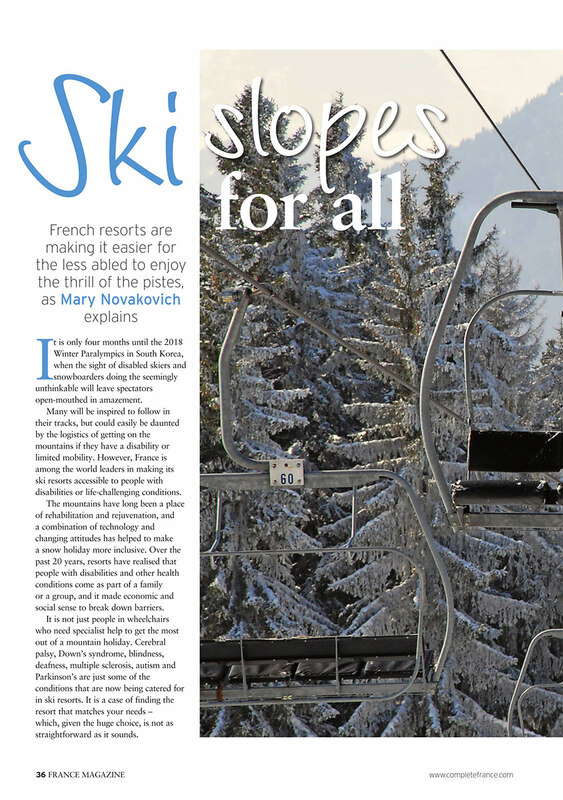 As well as a vast amount of other sporting and non-sporting activities for the whole family to enjoy, including sit skiing in France, accessible walking, hiking, fishing, cycling, painting, local food, gastronomic experiences, well-ness and wheelchair accessible accommodation. France, for anyone who is skiing blind or with a visually impairment; skiing with Down’s Syndrome; skiing with an amputation; skiing with Cerebral Palsy; skiing with Autism or a learning difficulty; Parkinson’s; Multiple Sclerosis or is paraplegic /quadriplegic and in need of somewhere that is going to offer great ski instruction, equipment and a warm welcome it is well worth considering France for a life-enhancing trip. With over 150 ski schools and organisations there truly is something for everyone! Whatever your need maybe, then enjoying a winter ski holiday or summer excursion in the French Alps or Pyrenees, is a hard place to beat! Fresh air, good food, exercise and a warm welcome are all vital ingredients to sustaining life. All these and more can be found in the majestic and awe inspiring scenic mountains; and what better place to rejuvenate, rehabilitate, find new life skills, de-stress, recover from trauma and find inner peace and equilibrium. Year round spiritual empowerment can be found visiting some of the most beautiful Baroque Churches to be found in the French Alps; staying in many of the small mountain villages to be found along the old trade and pilgrimage routes – the route des Grandes Alpes and the Route de Napoleon are but two. Please do not hesitate to contact us if there is anything you need or would like to discuss with us. In the meantime we know that our partners in France are looking forward to seeing you on the slopes!! With so much that France can offer people to ski with a disability, sensory, physical, neurological and other health related conditions we just do not have the room to tell you all so please click here for much more indepth information as to how France is playing its part in welcoming everyone to the mountains and in Social and Inclusive Tourism. The following are delighted to share their experiences with you on how France was able to assist and empower them to have a life enhancing winter and ski holiday. If you would like to speak directly with one of our beneficiaries please contact us so we can put you in touch – sometimes sharing a similar condition can be most reassuring especially for first timers! Ski 2 Freedom Foundation - Mountains 4 All is working in close association with organisations that will help fulfill a life-empowering ski and alpine holiday. Our main Associate Member in France for providing assisted and adaptive snow sports is the ESF (Ecole de Ski Français). However, there are other associations that provide exceptional 'handiski' adaptive year-round activities, especially for wheelchair users, and one such is Loisirs Assis Evasion based near Chamonix. Somewhere suitable to stay is always a priority, especially for wheelchair users, and we are happy to have the support of a number of accessible and inclusive hotels, chalets and apartments.